In this module you will learn how to use the Enlighten World Flag Slicer Custom Visual. The Enlighten World Flag Slicer takes a text field from your dataset and if the value uses a country’s name or abbreviation it will display a flag. This flag visual can then be used to filter other report items. Filter that automatically displays country flags. You can use either the common country name or the alpha-2 country codes. You can optionally display a single metric under each flag. This Enlighten World Flag Slicer shows the top 5 countries that give aide to other countries. Under the Format paintbrush there are a few customizations available for the Enlighten World Flag Slicer. 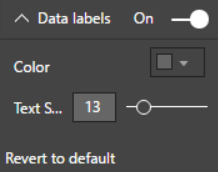 From the Data labels section you can change the color and the text size to the labels below each flag. You may also choose to turn off the labels all together. In the Items section you can turn off the shadow box that appears around each flag. You will likely want to keep this on because flags like Japan will look a bit odd on a white background without the shadow box.